When a job calls for heavy-duty cutting and drilling, a core drill motor is often the tool of choice. Whether searching for handheld or mounted products, you’ll find the perfect core drill motors for all your drilling needs at U.S. Diamond Tool. They’re ideal for workers who rely on tools for heavier tasks, which involving boring, demolitions, and similar projects. Choosing the right tools for a project is important. There are several different options to consider, and varying brands to compare as well. Electric core drill motors are good for projects that do not require drilling holes exceeding 70 inches. If the project demands over 70 inches, a hydraulic core drill motor may be better. When using an electric core drill motor, it is also important to have a meter box to protect the tool and to regulate power properly. Spend some time researching which bits are needed for the specific project. For everything from a quality DeWalt core drill motor to a trusted Milwaukee core drill motor, look no further than U.S. Diamond Tool. Find the right products for every project at a competitive price, and backed by excellent customer service! 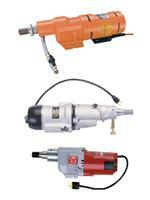 We carry Electric Core Drill Motors to handle any core drilling job. Motors have multiple speeds to drill a wide range of diameters.